When you are missing teeth, it affects far more than your appearance. It also compromises your chewing function and overall oral health. For Albuquerque, NM, patients with up to three consecutive missing teeth, Dr. James Slaman may recommend an implant-supported bridge. These restorations are more resilient and longer-lasting than their traditional counterparts. Dr. Slaman works with a trusted dental lab to create lifelike restorations which can last up to 10 years or more. Like their conventional counterparts, implant-supported bridges are designed to replace a row of missing teeth. 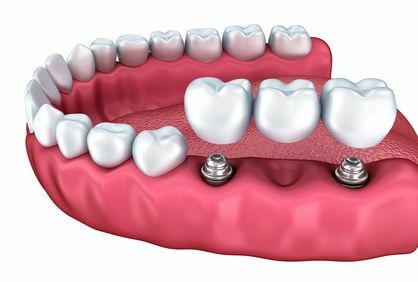 While a single missing tooth can be replaced with one dental implant and an implant-supported crown, two to three consecutively missing teeth can be replaced with an implant-supported bridge. There are a number of advantages to implant-supported restorations, such as optimal stability, jawbone support, and improved oral health. Patients considering any kind of dental implant treatment will require sufficiently dense bone, since every implant post must be completely embedded in healthy tissue. Patients who have experienced some degree of bone atrophy may be able to increase their eligibility for implants with a bone grafting procedure. Also, qualifying patients will be non-smokers, in good overall health, and will not have any medical conditions that could impede the success of treatment. Optimal stability: Since implant-supported restorations are anchored to implants rather than attached to natural teeth, they offer maximum stability over traditional bridges. Jawbone support: When teeth are present, the roots send signals to the nerves in the jaw through micromovements. These tiny movements stimulate bone growth and preserve existing bone health. If the teeth are gone, stimulation is no longer present. As a result, bone atrophy can occur over time. Since implants mimic the movements of natural teeth roots, they can actively protect your long-term oral health. Improved oral health: In addition to preserving the jawbone, implants also protect healthy tooth structure. For example, in order to place a traditional dental bridge, small amounts of enamel must be removed. This step is not necessary when choosing an implant-supported restoration and all healthy tooth structure is left fully intact. Many practices offer dental implants. However, few dentists are committed to the same level of care as Dr. Slaman. He is a member of the New Mexico Implant Study Club, and also serves as a mentor in the Spear Education program for dental professionals. In most cases, Dr. Slaman can perform your entire dental implant treatment, from start to finish, in one convenient location. If your case is complex, he will work with a trusted oral surgeon or periodontist to deliver predictable, top-tier care. At Dr. Slaman & Associates, we understand that spending money on dental treatment is a significant decision. That is why we offer a number of financing options for our patients, including CareCredit® and in-office payment plans. Our team can help you find a solution that will meet your needs and budget. To find out how an implant-supported bridge can help improve your oral health, bite, and smile, schedule your initial consultation today. Patients can send us a message or call Dr. Slaman & Associates at (505) 881-7586.